Would you like a snack or meal? That's how I approach the subject of weather apps on smart phones. Sure, I have apps, and they're great for quick nuggets of information, like calling up Doppler or a quick scan of the 7-Day. But analysis, context and perspective...on my phone? Good luck. People still add value that can't be automated or computerized. That's why the National Weather Service and local meteorologists are such an essential part of the equation. There was much hand-wringing over cancelling school yesterday so far in advance. Truth? We knew the main wave of snow and ice would arrive sometime during the afternoon, maybe in time for the PM commute. Timing it down to the hour was tricky, but we have an obligation to err on the side of safety and caution. Snow tapers off today, and in spite of midweek highs below 32F a higher sun angle should leave most freeways wet/slushy during the daylight hours. No more controversial storms; just a coating of slush on Saturday. Average temperatures feel good next week with a few 40s by mid-March. No robin sightings just yet. How Much Fell? The south metro picked up considerably more than the north metro, but as of 10 pm last night 10" had fallen from Wadena to Gull Lake. I was struck by the significant variations in snowfall amounts over a relatively short distance - almost like wild extremes from summer thunderstorms. The heaviest band of snow that moved through during the afternoon hours was convective, with reports of thunder and lightning (and snow) with snowfall rates of 1-2"/hour. Click here for more snow totals. Back to the 40s. A bad sitcom on Bravo, or the 14-day MSP outlook from ECMWF? Nothing subzero this week, but midweek will be a reminder that (on paper) it's still winter. By mid-March is may even feel like spring. Graphic: WeatherBell. A Mellowing March. No more arctic intrusions later in the month; the pattern dominated by a split flow with a fairly active southern branch pushing Pacific storms mainly south of Minnesota (with a few exceptions). The question will be precipitation-type, with an atmosphere increasingly too mild for all-snow. 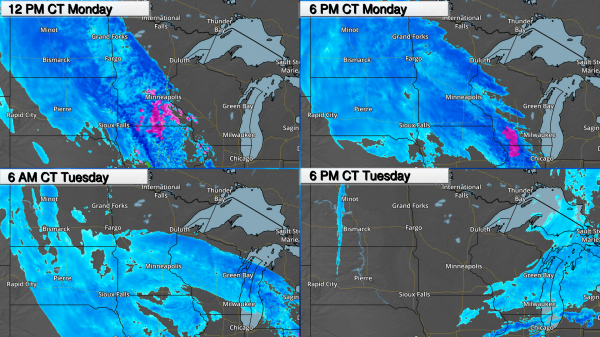 * A powerful system is bringing heavy snow and strong winds to the upper Midwest to begin the week. 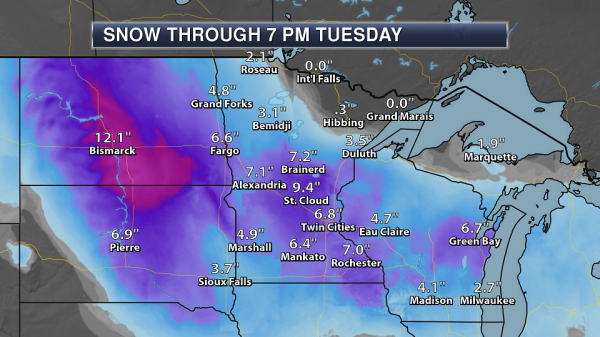 * Overall snow total of 6-12”+ will be possible across the Dakotas into Minnesota and Wisconsin. Snowfall rates of 1-2”+ per hour are likely. This snow will make travel difficult across the region. * Strong winds will cause whiteout to near-whiteout conditions across the region, especially while the heaviest snow is falling. The worst conditions will be across parts of the Dakotas into Nebraska, where a Blizzard Warning is in effect. * Some of the energy from this low pressure center will be transferred to a new developing low on the East Coast Tuesday Night into Wednesday. This will become a new coastal low which will have impacts Wednesday and Thursday across the region, including heavy snow. Warnings And Advisories. Blizzard Warnings are in effect from southwestern North Dakota to northern Nebraska for the potential of 3-10” of snow along with wind gusts of 40-65 mph. These winds will be capable of whiteout conditions and very difficult travel, including the potential of road closures. 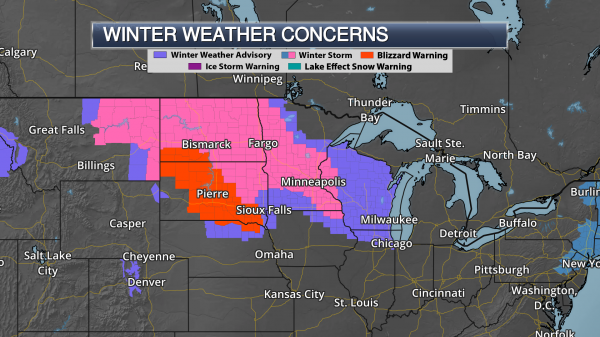 Winter Storm Warnings are in effect from eastern Montana into the Dakotas, Minnesota and western Wisconsin. These areas have the potential of 6”+ of snow, with some light ice glazing in spots as well. Winter Weather Advisories extend into Wisconsin and northern Illinois where snow totals are expected to mainly be less than 7”. Timing The Precipitation. Timing on some of the heaviest snow has slowed down by a few hours versus what we were forecasting yesterday. However, snow will continue to spread across the upper Midwest as we go throughout the day, with the heaviest expected to start in the Twin Cities during the early afternoon hours. Heavy snow will continue into the Twin Cities into the evening before tapering off to lighter snow which will continue into Tuesday. A period of wet snow is expected this evening in Chicago, with more snow possible into the day Tuesday. Forecast Snow Totals. A widespread band of 4-12”+ of snow is expected over the next 24-36 hours from the Dakotas eastward into parts of Wisconsin. The heaviest snow looks to fall across parts of the Dakotas and Minnesota, where some totals could top 12” – this all depends on how and where heavy snow bands set up across the region. Closer Look At Snow Totals. Across the Dakotas, some of the heaviest snow will fall across portions of U.S. 52 and U.S. 83 including Minot, Bismarck and Pierre. In these areas, snow totals of 8-12”+ are expected. The heaviest snow across Minnesota looks to fall across parts of central Minnesota, from Brainerd to Hinckley down toward St. Cloud, Willmar and the western Twin Cities. Snow totals of 6-12”+ are possible in these areas. Some recent high res models are trying to adjust the heavier snow even further toward the southwest (toward Redwood Falls) and will have to be watched closely throughout the day to see how heavy snow bands set up. Map: AerisWeather and Praedictix. Forecast Ice Totals. Along with the heavy snow, a period of freezing rain is possible across the upper Midwest. In most cases, freezing rain amounts should be less than a tenth of an inch. Blizzard Conditions Likely. 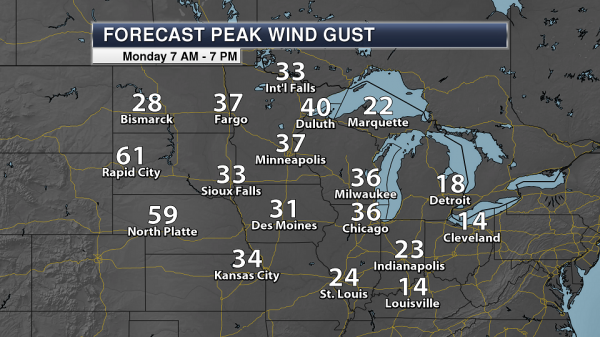 Strong winds are expected throughout the day across the upper Midwest, especially where Blizzard Warnings are in effect. Winds across the Blizzard Warning area are expected to gust between 40-65 mph today. These strong winds will be capable of creating whiteout conditions across the region due to blowing snow. Significant drifting snow may also be possible. Winds will remain strong into Monday Night and Tuesday, with winds gradually decreasing as the system moves off to the east. 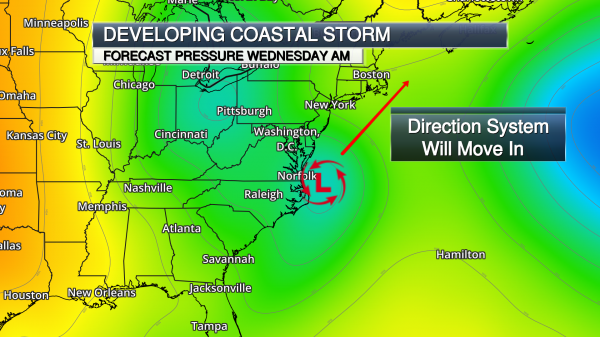 New Coastal Low Will Form. A new center of low pressure is expected to form off the Mid-Atlantic Coast Tuesday night and become the second coastal storm within a week to impact the Northeast. Heavy snow will be one of the big concerns with this system, as enough cold air will be wrapped in to keep the system mainly snow for New York City and Boston. We will also watch coastal flooding and wind concerns once again (though they don’t look to be as large of a concern as they were late last week), however all impacts will depend on the overall path of the system, which could change over the next couple days. Winter Storm Watches. 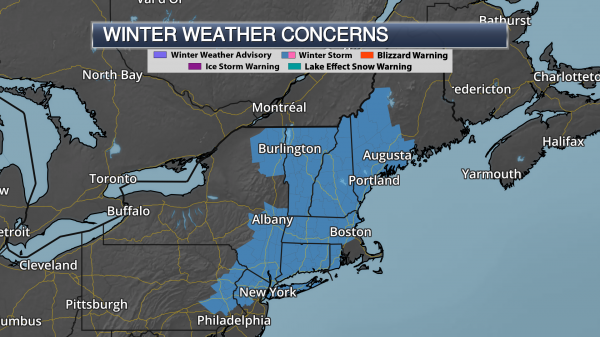 Winter Storm Watches have been put in place across parts of the Northeast ahead of this next coastal low. These areas currently have the highest potential of at least 6” of snow from late Tuesday Night into Thursday. These watches include New York City (where it is in effect from late Tuesday night to late Wednesday night) and Boston (where it is in effect from Wednesday morning to Thursday morning). Forecast Snow Totals. Here’s an early look at potential snow totals from this system on the current forecast track. The current forecast shows at least 6-8” of snow for both New York City and Boston from Wednesday through Thursday morning. 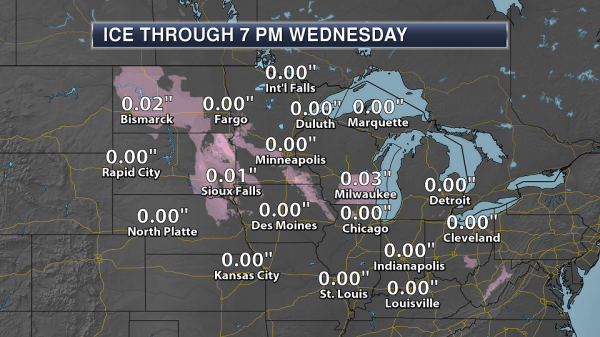 A lot of this snow will fall Wednesday into Wednesday night. Summary: Heavy snow and blizzard conditions will continue across the upper Midwest today as a powerful storm system moves through the upper Midwest. 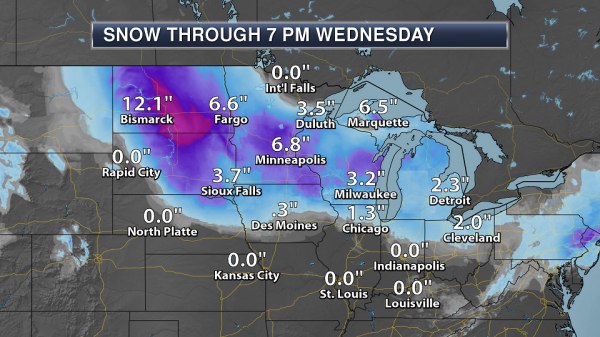 Snowfall totals of 6-12”+ will be common from the Dakotas to western Wisconsin. Whiteout conditions due to wind gusts of 40-65 mph, especially across Blizzard Warning areas, are expected. The combination of snow and wind will cause difficult travel conditions across the region in the next 24-36 hours, and may even cause some roads to close. Energy from this system will then combine with a new center of low pressure that will form off the Mid-Atlantic Coast Tuesday night. This becomes the next coastal low which will impact the Northeast late Tuesday night into Thursday with heavy snow, as well as strong winds and coastal flooding. The good news at this point is the coastal flooding and wind concerns do not appear to be as high as they were during the coastal storm late last week. National Weather Service Forecast: Cloudy With a Chance of Budget Cuts. In case you missed the update from NPR here's an excerpt: "...The Trump administration wants to eliminate 355 jobs, and $75 million from the weather service budget. "The straw is close to breaking the camel's back right now," says Daniel Sobien, president of the National Weather Service Employees Organization. "That will break the camel's back." Sobien says there are vacant positions across the board. "Tsunami warning centers are understaffed; the weather forecast centers are understaffed," he says, and places like the hurricane center and storm predictions center "are having big vacancy problems, too." The employees organization represents some 2,500 weather service workers. And Sobien says right now, 10 percent of the jobs at the service are vacant..."
Photo credit: "Forecasters at the National Weather Service office monitor Hurricane Irma on Sept. 9, 2017, at the hurricane center in Miami." Andy Newman/AP. How NASA Averted the 2060 Apocalypse. A post at Big Think reminded me that the nations of the Earth have come together before for a common cause - and it's a good thing they did: "...While conducting blue sky research—curiosity-driven scientific investigation with no immediate "real-world" applications—that scientists in the 1980s discovered that the ozone layer was being depleted. Realizing the danger this posed to life on Earth, scientists—and NASA's crack team of science communicators—mobilized the public, the U.N., and governments to get the Montreal Protocol signed, and to ban ozone-depleting chemicals for good. "We’ve since done atmospheric models that show that we would have actually destroyed the ozone layer, had we done nothing, by the year 2060..." says Thaller. "That would have destroyed agriculture. Crops would have failed all over the world. You couldn’t have livestock outside. People couldn’t have lived outside. We very nearly destroyed civilization, and your grandchildren would have lived through that..."
2017 Clean Energy By The Numbers. Here's an excerpt from a post at NRDC: "...At the end of 2016, wind became the largest source of renewable power capacity in the nation, overtaking hydropower. In 2017, the U.S. added another 6,250 megawatts (MW) of capacity, which is enough to power 2 million homes. While one may not think of Iowa, Kansas, or Oklahoma as leaders on clean energy, these states actually have some of the cleanest power in the nation. The Midwest has some of the best wind resources in the country, and utilities, policymakers, and U.S. businesses are taking advantage of this low-cost energy resource. Iowa’s largest electric utility, MidAmerican, expects to be generating 85 percent of its electricity from wind by 2019. In Kansas, the utilities are on track to supply 50 percent of the state’s power with wind by the beginning of 2019..."
Using Young-Blood Transfusions to Cheat Death? Stat News has the eye-opening story; here's an excerpt: "...There’s long been a thriving market of supplements, creams, and pills that promise to forestall aging. But lately, big players and investors have also spotted an opportunity: Google’s parent company has invested heavily in its secretive anti-aging spinout, called Calico. A startup called Celularity last month raised $250 million to try to use postpartum placentas to delay the aging process. 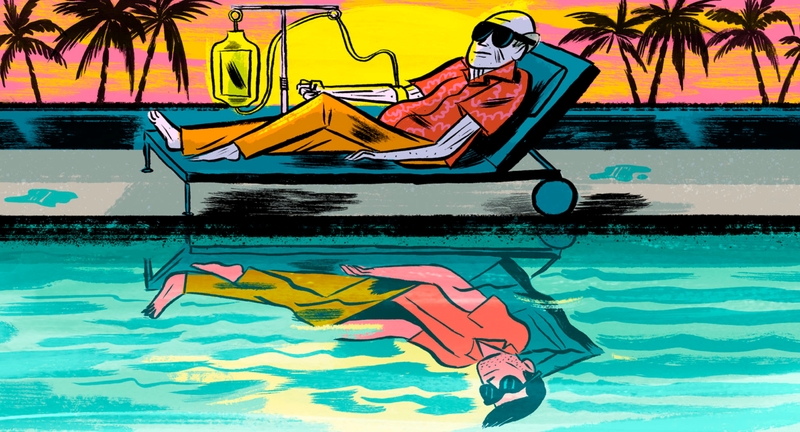 And a company called Elysium Health has rallied Nobel Prize winners to sell a $50-per-month supplement aimed at boosting levels of a molecule known as NAD+ that’s hypothesized to play a role in promoting longevity, though not without prompting rebuke from some prominent doctors..."
Image credit: Mike Reddy for STAT. News in a Disintegrating Reality. We (literally) don't know what we don't know - and much of what we think we do know is...fake. Here's an excerpt from Nieman Journalism Lab: "...It’s a huge problem. It’s the biggest problem ever, in my opinion, especially for American culture. Maybe it’s less of a problem for other countries and cultures, but the way our country works is just really susceptible to this. Those Russian statements about how Americans are impressionable and they’re easy to manipulate are largely true. It’s not because Americans are stupid, but because there’s been no effort to get ahead of the curve in terms of technological policy or privacy laws. There’s no protection for Americans or researchers right now. We’re fighting everything..."
38 F. maximum temperature yesterday in the Twin Cities. 59 F. high on March 5, 2017. They're Here to Fix Climate Change! They're College Republicans. A story at The Atlantic filled me with hope for the future: "...I think a lot of young conservatives are frustrated by the false choice between no climate action and a big government regulatory scheme. They feel pressured that those are the only two options, and they’re hungry for a conservative pathway forward on climate,” he told me. “The other thing that’s unique here is that the elder statesmen of the Republican Party are kind of uniting with the younger generation, to press the middle generation to act on climate.” The Baker-Shultz plan has four major components. First, it creates a new $40 tax on every ton of carbon dioxide emitted into the atmosphere, which comes to about an extra 36 cents per gallon of gasoline. It also creates a new “border carbon” tax, raising the prices of imported goods from countries that do not impose a carbon tax themselves..."
Photo credit: "An attendee wears a GOP elephant necklace during a California Republican Party convention in Burlingame, California." Stephen Lam / Reuters. Should Christians Work to Protect the Environment? Here's an excerpt of an answer from the late Billy Graham: "...For Christians, the issue is much deeper: We know that God created the world, and it belongs to Him, not us. Because of this, we are only stewards or trustees of God’s creation, and we aren’t to abuse or neglect it. The Bible says, “The earth is the Lord’s, and everything in it, the world, and all who live in it” (Psalm 24:1). When we fail to see the world as God’s creation, we will end up abusing it. Selfishness and greed take over, and we end up not caring about the environment or the problems we’re creating for future generations. It’s not surprising that some of the world’s worst environmental damage was done by the old atheistic regimes of Eastern Europe..."
As Climate Change Intensifies, Here Are the Most - And Least - Resilient Counties in America. Pacific Standard has interesting perspective: "...These findings were contained in a 317-page report that was released without fanfare in October of last year. EPA scientists had set to work on the tool, called the Climate Resilience Screening Index, under the previous administration. 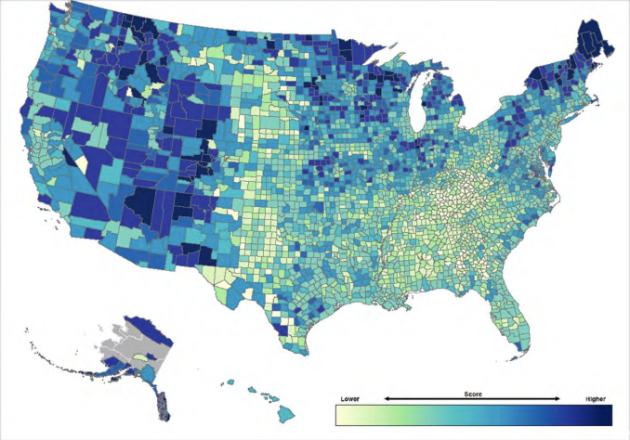 By ranking regions, states, and counties across the U.S., they hoped to reveal which areas need to boost their resilience most urgently—and to prompt local and national governments to act accordingly. Still, the EPA resilience report isn't just about extreme weather events, but also about how factors like inequality, ethnicity, and infrastructure affect a community's ability to deal with and recover from such events when they do occur..."
More Downpours - Increase in Heaviest Precipitation Events. The rain is falling harder - that's not a climate model, but based on observations. Here's an excerpt from Climate Central: "... A warmer world supercharges the water cycle, leading to heavier precipitation. To start, a warmer atmosphere creates more evaporation — for every 1°F of warming, the saturation level is increased by about four percent. With more water evaporating into the atmosphere, there is more available to condense into precipitation, and it’s coming down in bigger downpours. The national map shows where this change has been the most dramatic, indicating that the precipitation in the heaviest one percent of rainfall days is getting heavier. Science has attributed heavy rain to climate change for decades, but now we can analyze the role of climate change in individual extreme rainfall events. An analysis from our World Weather Attribution team indicated the rain from Hurricane Harvey over Texas was about three times more likely and 15 percent more intense from climate change..."
Fossil Fuel Subsidies At Least $373 Billion in 2015. Here's an excerpt from CarbonBrief: "Fossil fuel subsidies totalled at least $373bn globally in 2015, according to a new report which for the first time combines figures from two key intergovernmental organisations. The new figure harmonises estimates up to 2015 from the Organisation for Economic Co-operation and Development (OECD) and the International Energy Agency (IEA), which largely assess different countries in their estimates of fossil fuel subsidies. The report shows support in 76 countries dropped significantly in 2015 compared to 2014, when it sat at $551bn. However, the estimates do not cover all fossil fuel subsidies, therefore are likely to still be a substantial underestimate of global fossil fuel subsidies..."